ABS (or ESC) will not prevent accidents due to improper or dangerous driving maneuvers. Even though vehicle control is improved during emergency braking, always maintain a safe distance between you and objects ahead. Vehicle speeds should always be reduced during extreme road conditions. The braking distance for vehicle equipped with an anti-lock braking system (or Electronic Stability Control) may be longer than for those without it in the following road conditions. The ABS warning light will stay on for approximately 3 seconds after the ignition switch is ON. During that time, the ABS will go through self-diagnosis and the light will go off if everything is normal. If the light stays on, you may have a problem with your ABS.We recommend that you contact an authorized Kia dealer. Restart the engine. 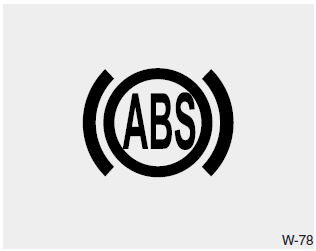 If the ABS warning light is off, then your ABS system is normal. Otherwise, you may have a problem with the ABS. We recommend that you contact an authorized Kia dealer.